It is the Survey of Historical Resources in the City of Bonita Springs, conducted by Janus Research in 2004. 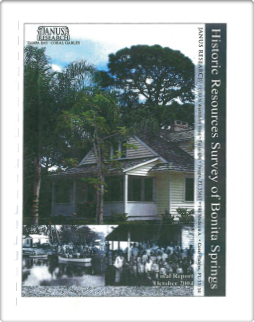 Click here for the photos from the Survey of Historical Resources in the City of Bonita Springs, conducted by Janus Research in 2004. The photo numbers correspond to their 8LL-_____ number listed in the Florida Master Site File. Click here for Supplements listed in the report.